PADI stands for Professional Association of Diving Instructors. Founded more than 30 years ago in the USA, PADI has become the largest international diver-certifying agency in the world. Today more diving certifications are issued by PADI than by all of the other agencies collectively. This has the advantage of worldwide recognition of PADI diving certifications, and allows divers to continue their education anywhere in the world. 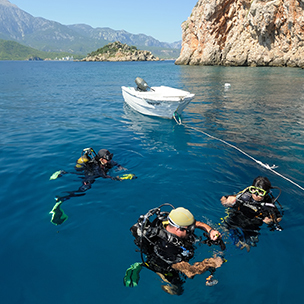 More than 3000 Dive Centers and Resorts are recognized for their achievement and their ability to train divers to the highest standards as well as for safety and quality in all the services provided. You'll read the five modules of your PADI OWD MANUAL. Then we will go over the Knowledge Review Questions after each module. Your instructor will discuss important issues in detail, introduce you to the equipment and, off course, answer all of your questions. Your knowledge will be tested by the Quizzes and after this has been checked and discussed you will make the Final Exam. In the pool, we'll do some exercises to get used to the equipment and to learn some important skills that are necessary for safe Scuba Diving. After finishing the Pool Dives, finally the real thing will start, The Open Water Dives, where we will test your skills again but this time in a real under water environment. Off course, your Instructor will accompany you. Finally, after finishing the 4 Open Water Dives, you will receive the PADI OPEN WATER certificate that enables you to go diving without an instructor worldwide. And a bonus, you will get 1 free Fundive from us to explore what we have thought you. You must be already fascinated by scuba diving so that you are looking forward to take it a step further. That's why we offer you the AOWD Course. The course involves 2 core dives: Deep Dive and Navigation Dive. Than there are 3 elective dives involved, you can choice between the following dives: Night Dive, Search and Recovery Dive, Boat Dive, Multi-level Dive, Underwater Naturalist Dive, Underwater Photography Dive, Underwater Video Dive, Peak Performance Dive. Similar to the OWD Course, you will have to read the PADI AOWD manual and make the Knowledge Review Questions before you are joining that specific dive, which we will check and discuss and we will give you some additional information. A really enjoyable course and it will give you the opportunity to expand your diving experience. The last certification before going PRO, you need to become certified in 5 specialties, and so many people prefer to take this course for more experience. The duration of this course depends on the specialties you choose, check the specialties we have. Its where you become PRO, this program offers your the opportunity to make diving as career or at least a part-time job, it contains lots of knowledge, lots of skills, regarding most of the things in diving including guiding dives. if you're one of those people who have interest in this program, drop us an email, and we will be more than happy to provide you with all the info needed.